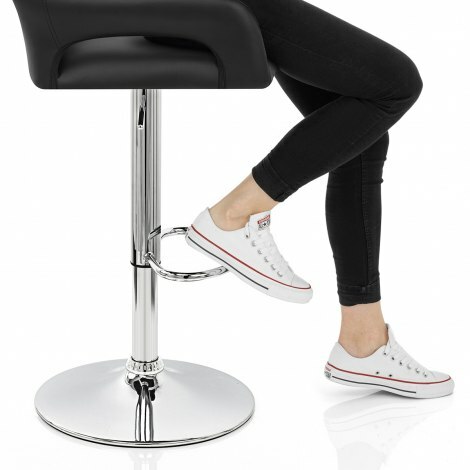 Atlantic Shopping is introducing a touch of German joy to its range with the Munich Bar Stool Black, a modern design with super supportive style. Designed to be the focal point of your kitchen bar area or breakfast bar, the Munich is entirely impressive. A Deutsch delight, the Munich comprises a shapely faux-leather seat. The rounded backrest curves in a beautiful semi-circle, producing a sunset-like effect. The elegantly arched armchair-like design of the Munich is supported by the presence of a rounded footrest. Completed with a chrome finish, the Munich offers a height-adjustable gas lift and 360-degree swivel, meaning it's astonishingly adaptable. An interconnecting chrome collar completes the beauty of the Munich, making it a quintessentially continental delight. "Quality product not the cheap imitations you see"
Just bought three of these to replace some very uncomfortable bar stools left by a previous owner. Lovely looking stools and very easy to assemble. They are also exceptionally comfortable and now there is never any space left at the breakfast bar as everyone loves to sit there. Great service and good price - Thanks Atlantic. Would 100% recommend them. Comfortable, stylish, easy to put together. Bought these as I had sat on something similar at a friends house and liked the support as well as no “spillage” from my larger than average backside... I was not disappointed - they are very comfortable and supportive. You can sit up straight & comfortably without feeling like you’re going to wobble off. A few visitors have compilmented me on their looks and comfort. Fit nicely under the breakfast bar. They are very reasonably priced compared to others I looked at in shops. I was nervous initially as I couldn’t see & sit on one before I bought it, but I wasn’t disappointed when they arrived. (Very easy to put together by the way). Very impressed with the quality and comfort of this stool. Brother even convinced it is improving his posture. Excellent customer service and quick delivery. Nice looking was very easy to essemble. Nice looking chairs easy to esemble. Prompt delivery, well made stool nicely finished very stable and solid.